Psittacosaurus, the 'parrot dinosaur' is known from more than 1000 specimens from the Cretaceous, 100 million years ago, of China and other parts of east Asia. As part of his PhD thesis at the University of Bristol, Qi Zhao, now on the staff of the Institute for Vertebrate Paleontology in Beijing, carried out the intricate study on bones of babies, juveniles and adults. Dr Zhao said: "Some of the bones from baby Psittacosaurus were only a few millimetres across, so I had to handle them extremely carefully to be able to make useful bone sections. I also had to be sure to cause as little damage to these valuable specimens as possible." With special permission from the Beijing Institute, Zhao sectioned two arm and two leg bones from 16 individual dinosaurs, ranging in age from less than one year to 10 years old, or fully-grown. He did the intricate sectioning work in a special palaeohistology laboratory in Bonn, Germany. Professor Xing Xu of the Beijing Institute, one of Dr Zhao's thesis supervisors, said: "This remarkable study, the first of its kind, shows how much information is locked in the bones of dinosaurs. We are delighted the study worked so well, and see many ways to use the new methods to understand even more about the astonishing lives of the dinosaurs." 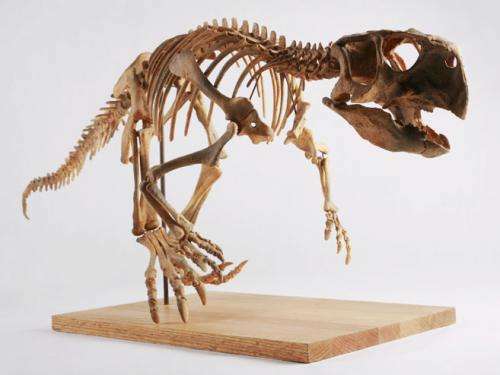 Professor Mike Benton of the University of Bristol, Dr Zhao's other PhD supervisor, said: "These kinds of studies can also throw light on the evolution of a dinosaur like Psittacosaurus. Having four-legged babies and juveniles suggests that at some time in their ancestry, both juveniles and adults were also four-legged, and Psittacosaurus and dinosaurs in general became secondarily bipedal." What's in a dinosaur name?